Yesterday my UPS guy dropped off a lens that I have been looking forward to using for some time, the Sigma 150 OS macro. This lens, which is on a long term loan from Sigma, is the newest version with Sigma’s highly regarded 150 macro with OS System (Optical Stabilization). When I picked the lens up for the first time I was glad to see the new style smooth paint coating and it feels solid but slightly heavier than the old non-OS version that I own. With the addition of OS (Optical Stabilization) this lens seems like it will take the almost perfect older 150 macro lens just a little bit closer to perfection. This lens has the latest 4 stop Sigma OS system which will be interesting to see if it is of any help out in the field since I do almost all of my macro work handheld. A more stable image should make framing and focusing easier when working close. Before I get out in the field with the lens I wanted to look at this lens compared to my old Sigma 150 macro. Overall the lens is 24% heavier and about 10% longer than my old 150, but I dont think this will be an issue in the field. Two other specs really stand out to me, first the price went from $600 for the old lens to $1099 street price for the new OS version ($940 MSRP to $1600 MSRP). The new lens design is all new going from 16 Elements in 12 Groups with the old lens to 19 Elements in 13 Groups, but more importantly is that the working distance went from 24 cm or 9.56 in to 38 cm 15 inch. This would seem to indicate that the new lens will not lose so much focal length at close distances compared to the previous version. Internal focus lenses shrink focal length as you focus closer, the 200mm Nikkor macro lens drops to only 140mm at 1:2. I posted a 50-150-180 background image comparison in 2011 : http://www.robertotoole.com/2011/12/12/which-macro-lens/. It seemed that the old 150 macro was not just 30mm shorter than the 180mm as indicated but instead there seemed to be a huge difference between the two so I am glad to see this change with the new lens. The new sigma 150mm F2.8 EX DG OS HSM APO Macro next to the old model Sigma 150mm F2.8 EX DG HSM APO Macro lens. I plan on putting this lens to use in the field this weekend to see if the lens is really an improvement over my old non-OS 150. Is it worth the 60% increase in list price. Will the OS really help with macro shooting and most importantly how is the image quality? 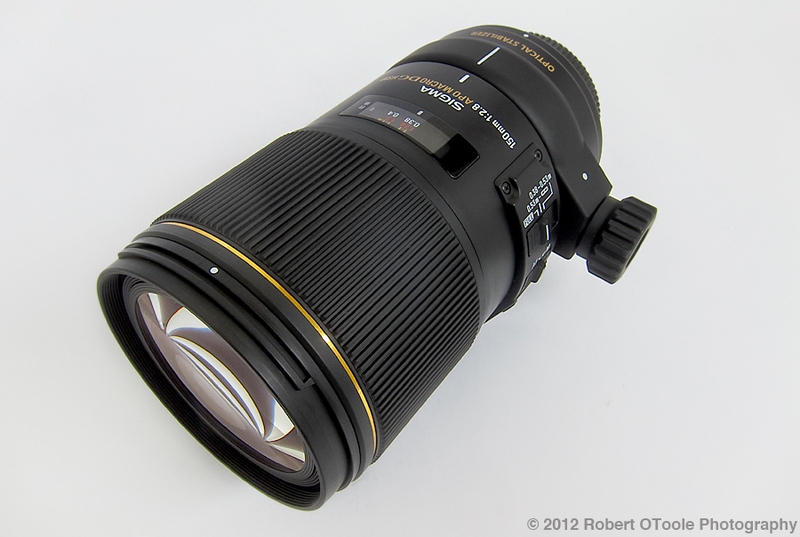 Also how does this lens compare to my favorite close-up lens, the Sigma 180mm macro? My findings and image samples will be up here in a couple of days. What does the long lens name on the lens indicate? DG - DG for Digital, this means that this lens will fit all DSLR sensor formats including full frame. This lens is compatible with Sigma's APO EX converters resulting in either a 210mm f/4 (1.4x) or 300mm f/5.6 (2x) combination. AF and OS remains functional and the maximum magnification ratio in macro setup increases to 1.4:1 and 2:1 respectively.